The San Francisco Bay Trail is a planned 500-mile recreational and transportation corridor encircling San Francisco and San Pablo Bays. 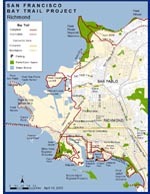 Authorized by State legislation in 1987, cities and counties developed the Bay Trail Plan in 1989 under the auspices of the Bay Trail Project of the Association of Bay Area Governments (ABAG). As of early 2017, about 350 miles of Bay Trail have been completed. 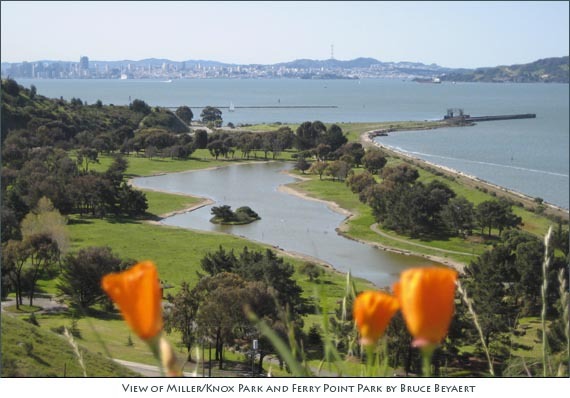 Richmond has 32 miles of shoreline - more than any other city on San Francisco and San Pablo Bays. Richmond also stands out as having more Bay Trail built than any other City. The Bay Trail now links all of the parks along Richmond’s Southern Shoreline connecting Point Isabel with Miller/Knox Regional Shoreline via the City’s Marina Bay parks - Shimada, Marina Bay, Barbara & Jay Vincent and Lucretia Edwards (where you may take a self-guided Bay Trail walking/biking tour). Click Here to view slide shows of major Bay Trail sections in Richmond. Credit for the 35 miles of Bay Trail now built goes to the City of Richmond and the East Bay Regional Park District, as well as private development projects which incorporated important Bay Trail segments thanks to encouragement by the City and BCDC. Completing Richmond’s remaining 7.5 miles of planned Bay Trail will be challenging and time consuming. NOTE: The 42 miles of planned Bay Trail exceeds the 32 miles of shoreline because the Bay Trail Plan includes loops and alternative routes for recreational and commuting uses. Closing each gap will require access to land, planning studies, CEQA compliance, construction design and funding for each of these steps, as well as for construction itself. Cooperation of the private sector will be critical since many of the remaining gaps are located on private lands. To receive these and other hard copy progress reports on Richmond’s Bay Trail, as well as announcements of special events, send an email to TRAC, the Trails for Richmond Action Committee.